COMPANY PROFILE Santos Ltd is an oil and gas company that is in the exploration and production stage. It produces natural gas, gas liquids and crude oil in eastern Australia. The company converts coal seam gas into LNG in Queensland and conventional gas to LNG in PNG. Santos Ltd was founded in 1954. The company’s name is an acronym for South Australia Northern Territory Oil Search. The first Cooper Basin gas discovery came in 1963, with initial supplies in 1969. Santos became a major enterprise, though overreliance on the Cooper Basin, along with the Moomba field’s inexorable decline, saw it struggle to maintain relevance in the first decade of the 21st century. However, the stage has been set for a renaissance via conversion of coal seam gas into LNG in Queensland and conventional gas to LNG in PNG. 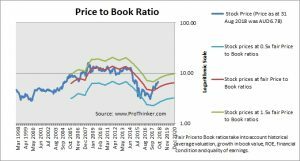 At the price of AUD6.78 as at 31 Aug 2018, Santos Ltd is trading at a Price to Book Ratio of 1.5 times current book value. 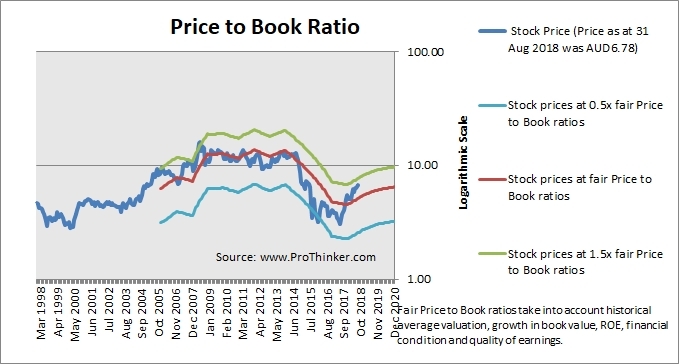 This is a 33.0% premium to current fair Price to Book Ratio of 1.1 times.